I was recently reminded that Radix: the Blog has just passed its fifth birthday. Unlike Stalin, I had no five year plan when I began it. But like Chairman Mao, maybe I've achieved the occasional Great Leap Forward. Although it doesn't do to dwell on the negative, I've had a few reversals of fortune on the way too; gardening is like life in that respect. 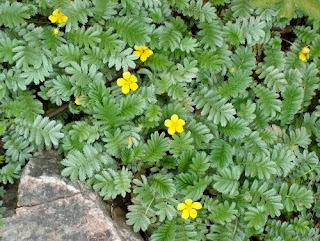 I've shown that breeding Oxalis tuberosa is possible with limited time, resources and talent. My ocas have been begetting in a Biblical manner - I'm now onto my 5th generation from seed, with seedlings popping up regularly where they shouldn't. Oca is well adapted to our maritime climate, but I haven't yet found that elusive day-neutral specimen which will tuberise in the summer and catapult it into the mainstream. Perhaps others will. Even in the spectacularly awful summer of 2012, my truly puny Coccinia abyssinica plants from the Ethiopian Highlands produced perfectly palatable and surprisingly large roots. What might they have done in a passably good summer? Thanks to Frank van Keirsbilck and some inadvertent crossing with a crop wild relative, I am now in possession of an enormous, vigorous yacon hybrid, which I have named Smallanthus x scheldewindekensis. So far no one is beating a path to my door, but it can only be a matter of time. Normal yacons seem demure by comparison, although they taste better. Maybe I should make some yakraut with the hybrid and see what happens? Although I haven't persuaded everyone to abandon 'hog peanut' and adopt the name 'talet', my respect for and interest in Amphicarpaea bracteata and its close relative yabumame remains undiminished. Talet is an outstanding wild edible and grows quite happily in Cornwall. I obtained seeds from what is (was?) the world's most northerly diploid population of Apios americana. The plants are (hopefully) still alive. In my world, that's a success. I've enjoyed the experience of growing the edimental bulbs cacomitl, camas and Triteleia laxa in my bulbous belly border project. I can confirm that they all taste good. Grows like a weed, looks lovely and yields abundantly; what's not to like? The small matter of its taste. Boiled, it's disgusting and even lactofermentation cannot redeem this incorrigibly unpleasant foodstuff. Yet some beg to differ, hence my mashua survey, which will doubtless yield something more interesting than the kilos of mashua I have to dispose of every year. Sweetpotato: Ipomoea batatas is a delicious, versatile and vigorous crop - if you live somewhere warm. I live in Cornwall. I tried some high altitude sweetpotato seeds from Papua New Guinea (as one does) in the hope of finding something more suitable to our temperature regime. Here are the results; judge for yourselves. My foray into crop wild relatives using I. pandurata (mecha-meck) and I. leptophylla (man-root) hasn't produced anything I can eat. Downhearted? Not I! Pachyrhizus ahipa: nitrogen fixing, edible raw. Probably needs a warmer climate than we have here. Shame. 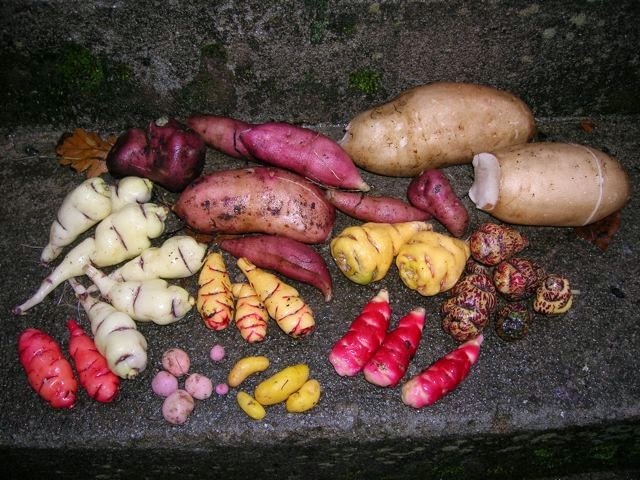 Ullucus tuberosus, the Ingrid Bergman of Andean root crops has been reduced to side show stunts like this. Shame on me. If only she had fulfilled her part of the bargain by giving some decent yields I would never have sunk so low. Things may be looking up on the ulluco front, however. Trawl the genus Ipomoea for potential sweetpotato substitutes and enjoy some more crop wild revelry. Continue to explore the potential of oca by growing an outrageously large number of seedlings. The great family Apiaceae, the umbellifers, have been heinously neglected by me, save for my not entirely successful attempts at yampah cultivation. In the hope of banishing arracacha angst, I've been growing species like skirret for a while, but haven't posted about them. This must change. Make rooty explorations of the floras of Africa, Australia and the Himalayan region. There's plenty of good stuff there. And - of course - I'm open to suggestions (and germplasm) of anything you recommend. I know for sure that I will be exhausted long before the plant kindom gives up all its riches; I wouldn't have it any other way. Happy birthday Radix! You forgot to mention your most towering achievement - you were mentioned in a truly wondrous Masters dissertation by yours truly ;) What more could anyone ask for? Congratulations! Yours was one of the very first blogs I came across in my quest to find out more about unusual edible plants, and it continues to inform and educate, not to mention cause yearnings for possession of yet more underground goodies. Here's to the next five years. Truly pioneering stuff! - including your earnest desire to send out plant beginnings to enthusiasts however ignorant and your encouragement ("If I can do it anyone can") which makes one feel less of a clot for having a bash. Looking forward to future developments. We need more people like you who are willing and ready to develop the next generation of root crops. I did try Yacon once. My dad sent it to me from California. Yacon does not do well in the heat! Best wishes with sweet potatoes. I have been growing them for years and I was only able to produce 2 seeds. Jerusalem Artichoke, or Sunchoke seems to be quite a variety to develop. Any plans for growing any more of that in the future? Thank you so much for your research and your humour. May there be many more blogging years to come. P.S. I must ask you about your sweet potato culture (and by that I don't mean the books you've read or actually I mean the books you've read ;) ) as I have most success under particular regimes. That said, we have more sun than Cornwall. P.P.S. If no one else is banging on your door, consider this a knock for Yacon. P.P.P.S I had to prove I wasn't a bot by writing rejoicing moreyac which sort of sounds like it could be a tuberous something or other. Happy fifth! You've really done a service for the world. If not for your blog, I wouldn't have spent a week of my life pollinating ulluco with a paintbrush. I wouldn't have spent hours trying futilely to track down stray mauka in North America. I definitely wouldn't have tried to prepare mashua a dozen different ways or experienced the unique "what is the fastest way I can get this out of mouth" sensation of raw mashua. Hmm. Why am I thakning you again? May your achievements get the recognition you deserve. This blog is great to read even for a mundane and very ordinary gardener like me. Congratulatons! you are a great inspiration to me, one day I will be a plant breeder. Isn't it great how one discovery leads to another, looking forward to reading about all your forthcoming discoveries in the next five years! Five years of radical writing - congratulations! You missed out one of your achievements: the inspiration and encouragement that you have given to others as the eminence verte of the amateur root breeding community. Here's to the next five years. fantastic! The internet became a richer place because of you, and I'm sure there's still lots to come!